One of the nice things about vacation was getting the chance to catch up on a little reading. I started with Beth Bernobich’s novel The Time Roads [Amazon | B&N | IndieBound], a collection of four novellas (or novelettes?) telling the story of an alternate Ireland at the start of the twentieth century. Part one, “The Golden Octopus,” introduces us to Queen Áine, the young ruler of the empire of Éire, and the scientist Dr. Breandan Ó Cuilinn, a pioneer in the science of time fractures. As a result of said time fractures, each novella reflects a slightly changed reality, with characters struggling to reconcile conflicting memories and events. One of the four stories, “A Flight of Numbers Fantastique Strange,” made the preliminary Nebula Award ballot after being published as a standalone in Asimov’s. I remember reading it then and very much enjoying it, and it was wonderful to get the broader context of the surrounding stories. It was particularly nice to see things start to come together in the final part of the book, which returns to Áine’s perspective as she struggles to deal with enemies who’ve learned to weaponize the time fractures. It raised the stakes and the pacing, and worked well to bring everything home. It’s not a traditionally structured novel, which may throw some folks off. But the steampunk/fantasy/time travel/alternate history mix made for an enjoyable read. Next up was S.L. Huang’s Half Life, [Amazon | B&N], the sequel to Zero Sum Game, which I enjoyed and reviewed a while back. 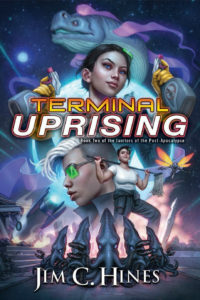 Mathematical genius and morally grey action hero Cas Russell is back, and this time she’s trying to track down a man’s missing daughter (who may or may not exist), fight off the mob, and track down some plutonium in her free time. If you liked the first book, you’ll probably enjoy this one as well. It has a lot of the same fast-paced action and non-stop plot. We get more of Chester and Arthur, who balance Cas out in good ways. It’s just plain fun reading. What we don’t get is much more about Cas’ background and origin story, though I imagine more of that mystery will be revealed in future books. I had some of the same nitpicks about using math to calculate things human bodies and reflexes simply aren’t fast enough for, but it was easier this time to let that go as part of our protagonist’s mysterious enhancements and backstory. I also thought the ending went a little over-the-top. I particularly enjoyed how Huang wrote about lifelike robots, and the way different characters responded to them. It explored a number of angles and ideas, and brought up some great ethical conflicts, not to mention tripping Cas up with logic vs. emotional instinct. It was a fun read, one I zipped through it in about two days, and I’ll be keeping an eye out for book three! Fox & Phoenix [Amazon | B&N | Mysterious Galaxy] is a change from Beth Bernobich‘s first novel, Passion Play (which Sherwood Smith and I discussed here). The king of Lóng City is dying. For Kai Zōu, the news means more than it does for most former street rats in the small mountain stronghold, because he and the king’s daughter are close friends. Then the majestic ruler of the ghost dragons orders Kai to travel across the country to the Phoenix Empire, where the princess is learning statecraft. In a court filled with intrigue, Kai and his best friend Yún must work together to help the princess escape and return to Lóng City. I enjoyed the world-building, which creates a pseudo-China both modern and medieval, with magic filling the role of electricity and technology. I liked the ghost dragons and the spirit companions (particularly Kai’s companion Chen the pig) and especially the (not-)dead griffin. I liked the awkwardness of post-adventure relationships between Kai and his friends, all of whom were changed by that adventure. My other complaint would be Kai himself, who made me a little grumpy in the first part of the book. This may be my own personal peeve, as I find myself with no patience for traditional teenage angst these days. (I lived it; I don’t want to relive it.) As the book progresses, Kai does move beyond that angst, and it feels like he finds himself and his role again. The book does a nice job of exploring some of the implications of the commodification of magic, and how politics and magic intertwine. But I think the characters are the strongest part of the book, particularly in the ways they’ve changed, and the way they find new ways to come together at the end. Fox & Phoenix comes out on October 13. You can read an excerpt on Bernobich’s website.